The NMRShiftDB is an Open Data repository for annotated NMR spectra. The fun here is to add NMR spectra of rare nuclei. Don't you just love a molecule with NMR shifts for all atoms? Kohonen maps, or self-organizing maps (SOM), are a machine learning method that have interesting visualization features. They have numerous applications, and also in chemistry. The group where I did my PhD developed a supervised SOM, which I used them to classify crystal structures (doi:10.1021/cg060872y). Another of my favorites is the reaction classification by Aires-de-Sousa et al. using unsupervised SOMs. People who know me personally, know that I like tasting things. That also makes me have to worry about overweight. Taste is to a large extend governed by cooking, and the Maillard reaction plays an important role here. If you like to learn more about the chemistry of cooking, checkout these two blogs. No, not the database, but the nice graphical article abstracts in chemistry journals. 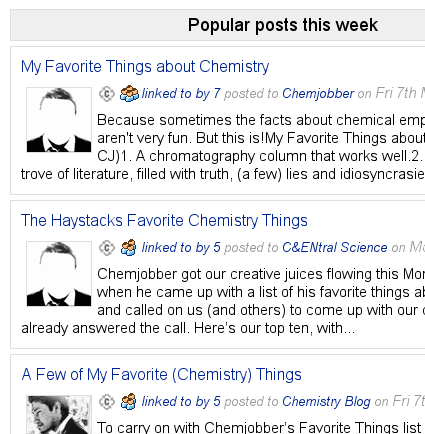 ChemFeeds gets is all together. BTW, there remains very much to be done about improving publishing chemistry. I blogged about that repeatedly. Organometallics is, like metabolomics, a really interesting area, with lots of complexities (pun intended :). Actually, I am not even aware of a organometallics/metabolomics mashup. Anyone with some nice pointers? 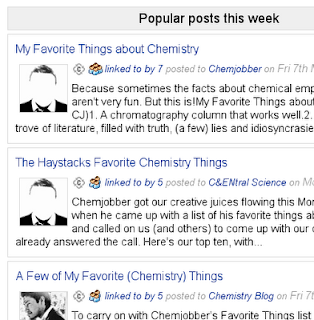 I have not blogged about it much, and the one time I did was in relation to chemical graph theory. Burning things. Nothing more to say about that, I guess. Well, perhaps. Chemists like burning things; others might too, but chemists at least. Blowing up things too. When I was a student, I had a very friendly colleague who liked blowing up things and made TNT himself and took that to university too (stabilized, mind you :). Cool! I teach chemistry at Hampden-Sydney College, a small liberal-arts college in central Virginia. The students here, by and large, do not come equipped with insatiable curiosity about my discipline and experience has convinced me that the profession of professing has more to do with motivation than with explanation; a student who is not curious will resist even the most valiant attempts at compulsory education; conversely, inquiring minds want to know. A great deal of my time, then, has been spent devising tricks, gimmicks, schemes and plots for leading stubborn horses to water, knowing full well that I can’t make them think. Now, that leaves me with tagging a few further blogs to tag to continue the meme. The meme is spreading fast, so I hope I do not tag someone who already is tagged. Jean-Claude, Peter, Noel, Rich, Antony, would you mind letting us know your ten favourite chemistry things?